The need for management education in today’s world for effective performance is a foregone conclusion. While experience might have been the backbone of effective performance in the corporate world of yesterday, knowledge and continuous learning is the mainstay amongst the best organizations of today. 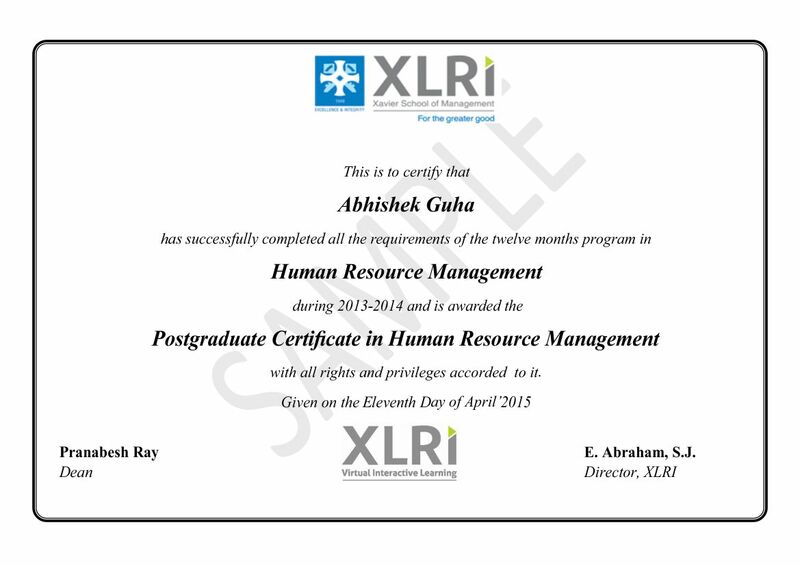 In order to satisfy this thirst for knowledge and to become a learning organization, XLRI has evolved a 12 months consolidated program in Human Resources Management. To give participants an understanding of problems and issues in the field of Human Resource Management. To learn the critical elements of Human Resource Management processes. knowledge that will enable them to function successfully in their chosen field. Executives and professionals in business organizations, interested to pursue a career in the HR domain, may apply for this program. The program offers quality interactions with experienced executives, and peer group learning as average experience of the participants is around 5 years. Must possess minimum of 3 years of work experience in related field after completing graduation. Full Time Degree Graduates (10+2+3) in any discipline, recognized by UGC/AICTE. Recognized Certification from XLRI – one of the foremost B School in the country and reputed to be one of Asia’s finest business schools. Selection is through a personal interview by the XLRI senior faculty members. Rigorous Programme Structure with assessments for every course. Competitive Price of INR 2.5 lacs - This price for a program of this brand is not available in country today. Learning from the best faculty in India and Industry Experts. Alumni membership of XLRI present globally - which has its own sets of advantages for identity, brand value, and marketability of the participants. All fees mentioned above are exclusive of GST. GST at the rate of 18% will be applicable on the fees mentioned above. Any change in GST or any other applicable taxes during the tenure of the programme needs to be borne by the student. Please Note: Installment dates are approximate and subject to change if applicable. All fees mentioned above are exclusive of GST. GST at the rate of 18% will be applicable on the fees mentioned above. Any change in GST during the tenure of the programme needs to be borne by the student.